Just before we dropped dad off to the airport, we decided to have brunch on the way. So a few places came to mind and in the end, we thought of going to South Perth to see what food they have to offer. On the way down to South Perth, I flipped through the Entertainment Book and discovered an Entertainment voucher for Halo Espresso. Without looking at the reviews on Urbanspoon, we decided to give Halo Espresso a try since we were in the area. We arrived at the peak lunch hour during a weekday and Halo Espresso was busy. As usual, we just missed out on breakfast and had to order from the lunch menu. 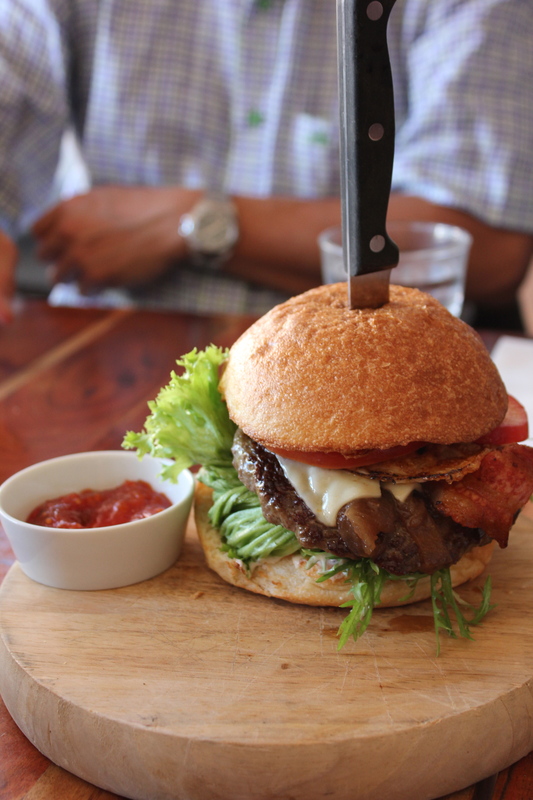 Dad had the Halo Burger ($17.90) which consists of 150g beef, bacon, egg, beetroot, dijon mustard, cheese, caramelised onion, tomato relish, lettuce, tomato and mayo. I had a taste test of the burger and the beef patty was tender and juicy. The tomato relish complements the burger well. It was a bit messy to eat but well, I guess that’s what burgers are for. 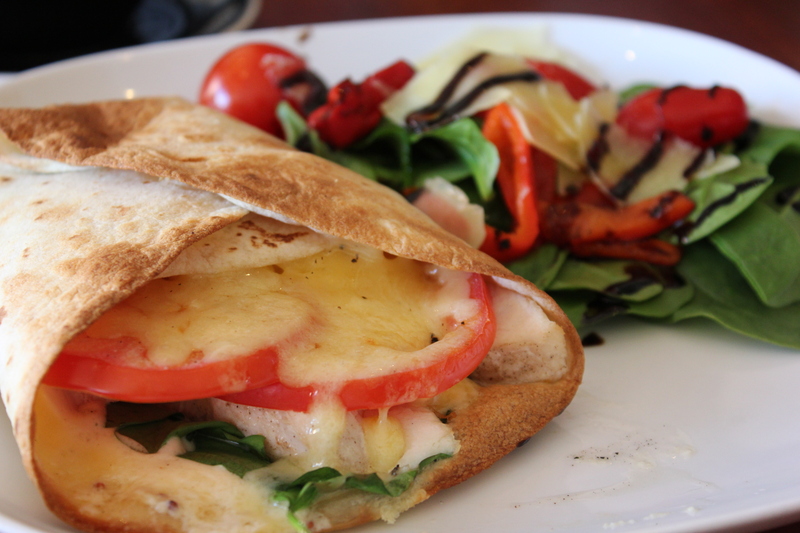 Mum had the Toasted Flatbread ($11.90) with shredded chicken, cheese, spinach, tomatoes and aioli. The shredded chicken was tender with a good amount of melted cheese on top the crispy flatbread. 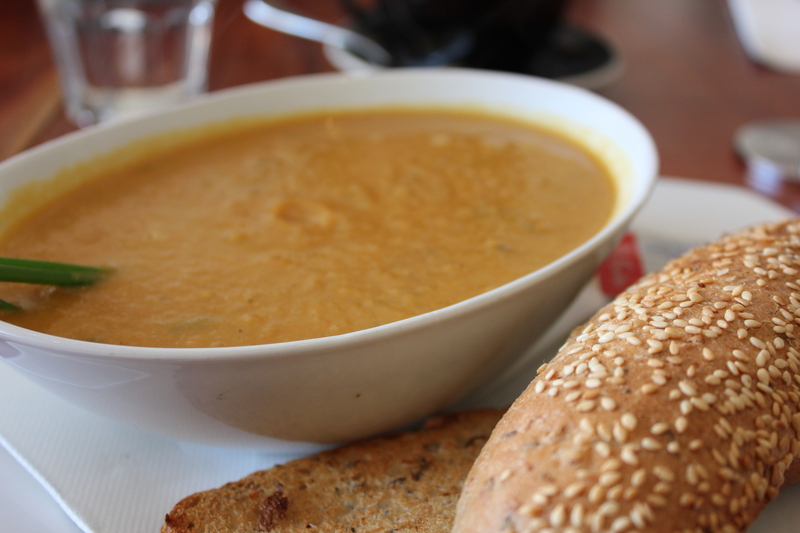 I had the Soup of the Day ($11.90) which was the sweet potato and pumpkin soup. I enjoyed my soup and thought that it was creamy and full of flavour. You can never go wrong with ordering soup during winter. It’s winter comfort food. The serving was also very generous as the soup came in a large bowl. I was really full when I finished my soup. Halo Espresso is actually famous for their coffee and was voted No. 4 Best Coffee Spot in WA by Menu Magazine. Dad and mum had the coffee and they thought that it was good. The service at Halo Espresso were friendly but we had to wait quite a while for our food to be brought out. By the time our food arrived, we had already finished the coffee and hot chocolate. (I guess maybe it was a busy day?) I thought that the food was alright but I guess the coffee may be well worth trying.